The Laser Cutter is controlled by the use of line ONLY! But, the beauty of it is that you can create a 3D form and slice it into individual sections (NURB planes or Waffle systems), send it to the printer and then put the pieces together to form the sculpture! There are only three acts that the laser can perform: cut, engrave, and raster. 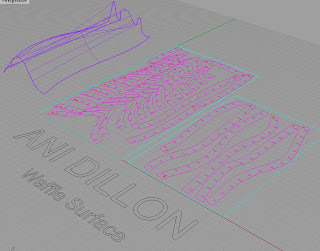 Here is the waffle surface I chose to create.